Every day, thousands of steel wheels roll over hundreds of miles of welded rail in eastern Washington State, carrying raw materials and goods bound for distant destinations. BNSF's Northern Transcon passes golden fields of wheat, grass hay, and other crops found in the rolling hills between Pasco and Spokane. Stretching nearly 150 miles across The Evergreen State, the Lakeside Subdivision sees over 50 trains per day and traffic continues to increase. Our tour begins at the busy hump yard in Pasco where rail cars from all over the nation are classified. Then we turn east, as trains roll past acres of rich farmland dotted with small towns and big grain elevators. Trains put on a great show climbing Providence Hill and rolling through Marshall Canyon in the snow. 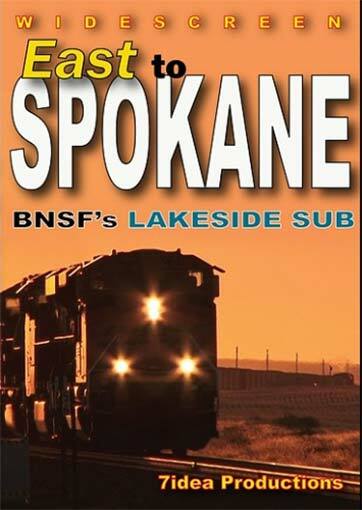 The Lakeside Sub sees unit coal, grain, and oil trains as well as mixed manifests and intermodal trains running between Portland, Oregon and Chicago. Amtrak's Empire Builder makes several appearances too. 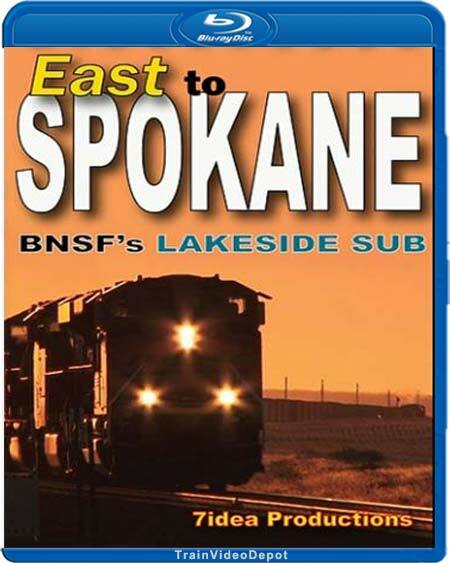 If you like modern day mainline railroading, then come along with us as we travel "East to Spokane� on BNSF's Lakeside Sub! Nighthawk262 (Oregon) on 2014-10-19 14:20:31. I thought this video was really well done and the narration was very informative and you get a great idea of what is going on in the area, even outside of the tracks. Also the history was very well explained. I really appreciate 7idea productions for covering routes that others never have. Though the route is mostly just farmland, the photography makes the best of it and the scenes at the end of the line are more scenic. I watched this video after a long day of work and maybe missed some things. But overall, a standard very well done 7idea program. Dave Feath (Harrisburg, PA) on 2014-11-19 06:59:35. Before watching this video, I thought that eastern Washington was a boring place to see trains. I was wrong. Aaron and 7idea productions have done it again; taken a place were railfans rarely visit and turn it into a must-see place. Along with the numerous trains, the scenery pictures were fantastic. I was impressed with the sunrise/sunset scenes that were influenced area wildfires. My favorite train parts of the video were the trains in the snow going through Marshall Canyon and the high bridge in Spokane. My favorite scenery shot were the seven deer crossing the tracks. In 42 years of watching deer, I've never seen that. This is another masterpiece from Aaron and 7idea. If you love well-crafted train videos, you need this one! Rail Buff (Southern California) on 2015-08-07 15:11:29. Like Dave Feath, I thought miles and miles of farmland would be boring, for a city bred and born urbanite, and was loath to get it. However after Dave's review I decided to take a chance. I'm glad now I did - thanks, Dave, except for you I'd have missed it. If anyone can make something interesting, it's Aaron and 7 Idea Productions and they didn't fail on this one. As I've said in another review, Aaron and his staff have the eyes of an artist and Aaron's descriptions are those of a poet. I've got 29 7 Idea Blue Rays and every one is a "home run". Obviously, I can't say enough good about them. But, back to this one, GET IT it. You won't be disappointed. run8anderson (Basking Ridge, NJ) on 2014-12-30 14:02:44. Well.....for me, it's automatic. When 7idea releases a new video....I order it from T.V.D. I watch it. I give it 5 stars. Once again, great research, videography, narration and route selection. Thanks 7idea for another zuper superior production.